Lieutenant Colonel Todd Houchins, commanding officer of the 53rd Test Support Squadron and one of a dwindling number of qualified F-4 Phantom II pilots in the United States Air Force, strapped into the front seat of a QF-4 Phantom today, readying himself to depart from Tyndall AFB, Florida for Holloman AFB, New Mexico. 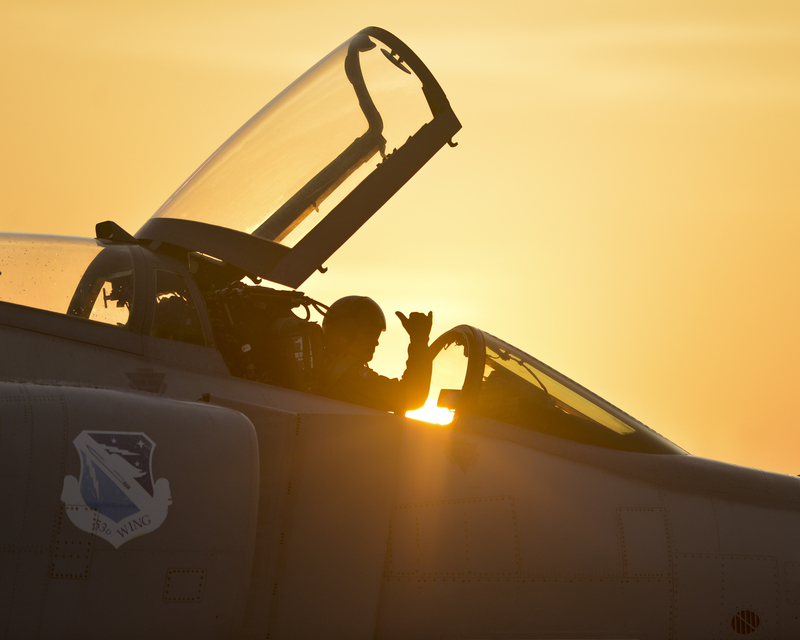 With the canopy still open while taxiing the Phantom out, he briefly waved the Hawaiian “hang loose” gesture to onlookers before returning to an all-business demeanor. Closing and locking the canopy, Houchins was cleared for takeoff, and with a smooth and practiced motion, he pushed the throttles of the Phantom forward, eliciting a mighty roar from the twin General Electric J79 engines as they kicked into afterburner, lifting the big gray jet into the air. Waving his wings in a salute to Tyndall and the folks on the ground, he turned westbound as he climbed, settling in for the ride over. What makes this particular flight unique (and extremely depressing) is that it was the final takeoff of the QF-4 as part of the 82nd Aerial Target Squadron. An ominous sign that the end of the F-4’s days with the US military is fast approaching. It will remain at Holloman for the rest of its life, before it’s presumably destroyed as an aerial target. With the QF-4s gone, the 82nd ATS has adopted the QF-16 as its next aerial target, which better simulates fourth and fifth generation air-to-air threats that American fighter pilots might possibly face in the next 15-20 years. The QF-16, like the QF-4, can be flown either manned or unmanned. While some of us at TACAIRNET don’t like the fact that the last of the American Phantoms will most probably be blown to smithereens by Air Force (or Navy or Marine Corps) pilots during training exercises, I personally feel that there’s no better way to go out for a jet that’s built to fight. Phantoms phorever, my friends. Well, from the author’s point of view, being destroyed while flying, and in combat, is a nice way to go for a warrior such as the Phantom II. But it’s kind of sad that it can’t be placed in a museum.